At heart, ADS-B is really just a new way to manage air traffic. As such, it will eventually replace radar as Air Traffic Control's (ATC) primary tool for separating aircraft. It's different from radar in that it does not depend on controllers in a central location watching radar scopes. Instead, aircraft self-report their GPS position in a networked environment, so pilots can see the entire air traffic picture around them. There is also the added benefit of datalink weather and traffic available through ADS-B. This system doesn't need radar to work properly, but it does depend on a network of ground stations to receive aircraft reports and send them back to ATC. These stations also transmit weather and traffic information back up to properly-equipped aircraft. This network currently consists of over 500 stations, and the initial phase is complete. So when you hear that ADS-B moves from a "ground-based" radar system to a "satellite-based" system, it's only partially true. ADS-B Out is a surveillance technology for tracking aircraft - it's what ATC needs to manage traffic. This is the transmitter mounted in your airplane that reports your position, velocity and altitude once per second. This transmission is received by ATC and nearby aircraft and this data makes up the equivalent of a radar display. Most aircraft will be required to have ADS-B Out by January 1, 2020 (see below). 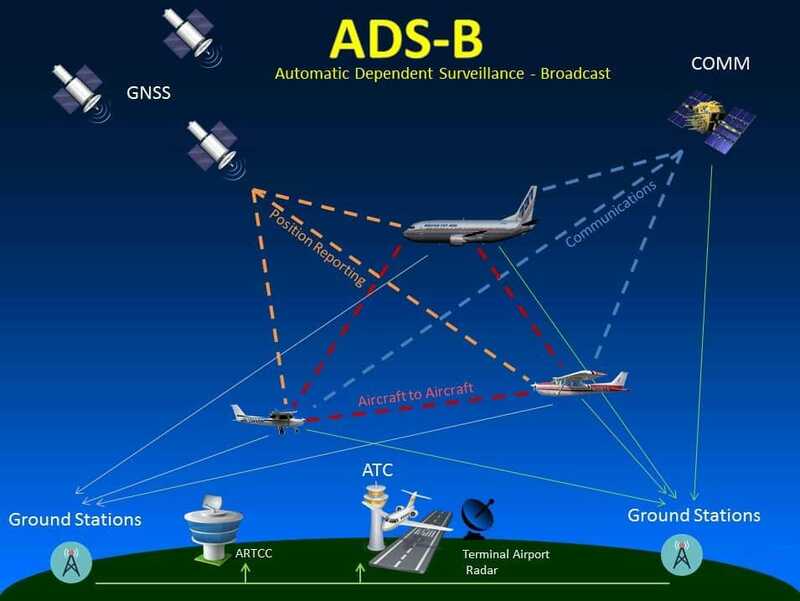 ADS-B In allows an aircraft to receive transmissions from ADS-B ground stations and other aircraft. This is how pilots can get subscription-free weather and traffic in the cockpit. Adding ADS-B In is strictly optional. While it offers some great benefits, the FAA is only concerned about you equipping with ADS-B Out - the free weather and traffic is simply the carrot to get you to upgrade. 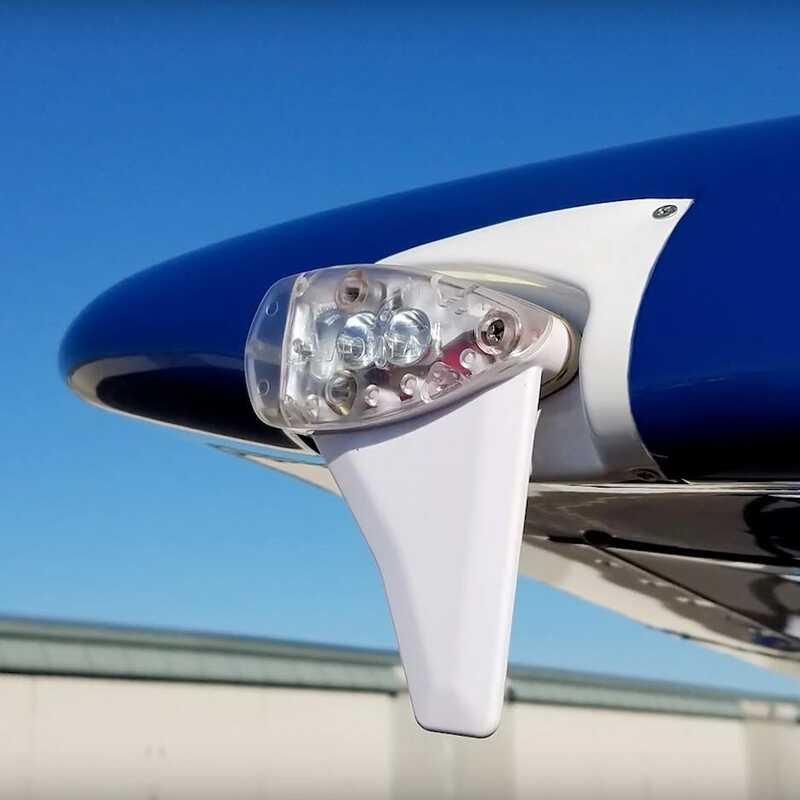 Note that there are various combinations of these two: Out-only equipment that simply meets the FAA requirement, In-only portable devices that receive weather, and ADS-B In/Out products that do it all. One thing to keep in mind - there is no such thing as a portable ADS-B Out device. All Out equipment must be panel-installed. 1090 Extended Squitter (ES) is based on 1090 MHz, just like our Mode A/C/S transponders. In fact, some Mode S transponders (like Garmin's GTX 330) can be upgraded to an ES transponder by upgrading the software and adding a WAAS GPS. This is the only technology accepted outside the US and above 18,000 feet, so it is popular with turbine airplanes, but it's also a good choice for piston airplanes that need a new transponder. ES receivers can detect other aircraft with ES transmitters air-to-air, and they can receive other traffic information uplinked from ADS-B ground stations. But there is no weather datalink on 1090. This ends up being a real mess. You can have all kinds of different equipment: 978 Out only, 978 Out/In, 1090ES Out only and even a combined 1090ES Out/978 In. At the end of the day, you should choose the Out frequency that matches your flying. If you fly above 18,000 feet or outside the US, 1090ES is your only option. If you don't, a 978 UAT could work and save you some money. Also consider how good your current transponder is - you're required to keep it in the airplane with 978 solutions. Here's our longer advice on 1090 vs. 978. After you've chosen your Out frequency, the only other decision is whether you want ADS-B weather; since that's only available on 978, that's a simpler decision (but remember that your 978 receiver could be a portable). Since weather and traffic come into play so much during any discussion of ADS-B, let's define some terms: FIS-B and TIS-B. These are the two products that we can receive via ADS-B In. Flight Information Services-Broadcast (FIS-B) is just a fancy name for datalink weather. Only available with a 978 MHz receiver, the end product is very similar to what we're used to seeing with XM Weather. NEXRAD radar, METARs, TAFs, TFRs, AIRMETs and other information is continuously updated in flight, and all this can be displayed on either a panel-mount MFD or a portable device like an iPad. There is no monthly subscription fee with FIS-B (your tax dollars paid for it), which is a nice feature. But unlike XM Weather, ADS-B weather uses the network of ground stations, not satellites. 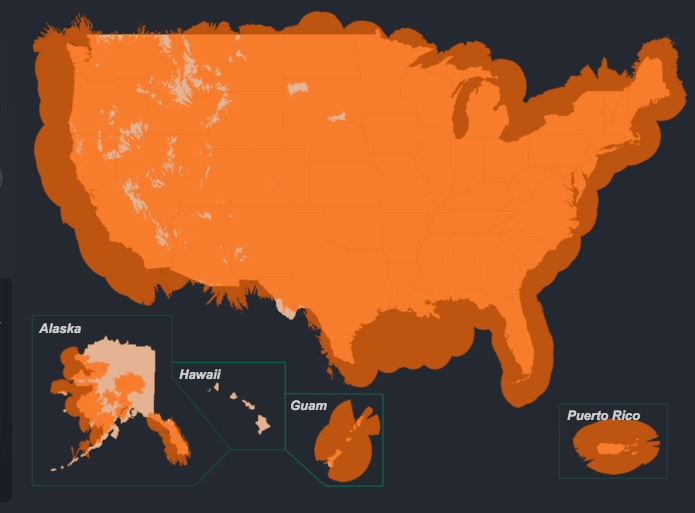 That means coverage, while pretty good in most parts of the US, is not as universal as XM. Traffic Information Services-Broadcast (TIS-B) is what the name suggests - datalink traffic. But leave it to the FAA to make this complicated. Unlike ADS-B weather, which is broadcast to anyone in range of the ground stations, ADS-B traffic is a custom report that is only sent to aircraft with ADS-B Out. If you're flying with an ADS-B Out transmitter in your airplane, you'll get an excellent picture of all traffic within roughly 30 miles of you. But if you're not flying with an ADS-B Out transmitter (say, with a portable ADS-B In receiver), TIS-B is fairly unreliable. Read this article for complete details on this confusing subject. Remember that, while datalink weather and traffic are nice, the whole point of ADS-B is for ATC. And the FAA has some grand plans for how ADS-B will transform the way it does business, claiming it will reduce aviation's environmental impact, improve safety and increase capacity at airports. A lot of this seems awfully optimistic, and will not be a reality for many years (if ever). But there are some more realistic improvements that will probably come to pass sooner. Since ADS-B is so much more accurate than radar, separation minimums can be reduced. This should lead to at least a little more direct routing and some increased capacity. Because ADS-B does not require radar, air traffic control will be available in many remote areas that cannot be served by radar. ADS-B will also impact ground operations, giving controllers the ability to prevent runway incursions and ground traffic conflicts. But of course this won't come free. Final ADS-B Out rules were finalized in 2011. 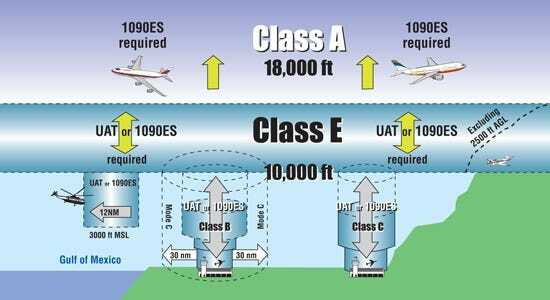 Those rules say that by January 1, 2020, all aircraft will be required to have ADS-B Out equipment to fly in Class A, B and C airspace, plus Class E airspace above 10,000 feet but not below 2,500 feet. You'll also need it within the 30nm "Mode C Veil" around Class B airports. So in general you'll need ADS-B Out most of the places you need a Mode C transponder today - and you'll need to keep that Mode C transponder if you install 978, because radar will be the backup for ADS-B. That does mean some pilots will not have to upgrade to ADS-B Out. If you fly a Cub on sunny Saturdays away from major airports, you’ll be exempt. But if you use your airplane for any type of transportation flying, plan on equipping with ADS-B Out by 2020. This ADS-B Out transmitter must be a panel-installed, certified solution (again, no portable ADS-B Out option). An approved WAAS GPS source is also required, to make sure your reported position is accurate. Remember, though, there is no mandate for ADS-B In equipment. There are a number of products available now to satisfy this requirement, from major avionics manufacturers like Garmin, Appareo and others. Prices vary significantly, but average about $2500-5000 (including installation). This may all sound overwhelming, and the FAA certainly has made things complicated. But the end result is pretty simple: by January 1, 2020, you will most likely need to install an ADS-B Out transmitter in your panel (or upgrade your Mode S transponder if you have one). The only questions are what solution to install and when to do it. The market for ADS-B Out products is pretty mature now, with a number of good choices and pretty stable prices. You can choose from 1090 or 978 solutions, with or without GPS, and with or without ADS-B In. Match your airplane, mission, current avionics, and budget to the right option. You can see them all here. 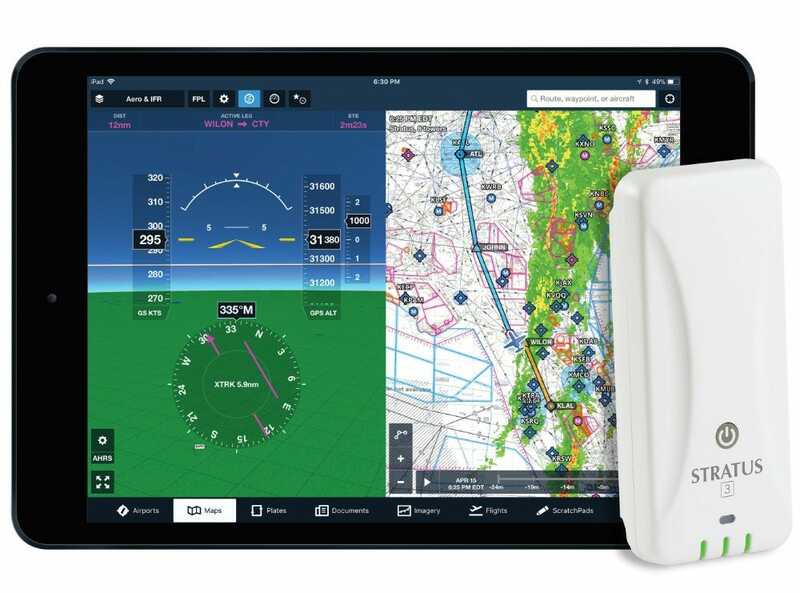 Of course there is already a red hot market in portable ADS-B receivers, like the Stratus, Garmin GDL 50 and ForeFlight Sentry. These are easy and inexpensive ways to get subscription-free weather on your iPad or portable GPS, and have become quite popular over the past five years. But they do not address the 2020 mandate for ADS-B Out, and traffic is unreliable until you equip with ADS-B Out. One option that many pilots choose is to combine these two products: install an ADS-B Out transponder in the panel, but use a portable receiver for ADS-B In. That would comply with the 2020 rule at a fairly low cost, but give you complete weather and traffic datalink. The only major drawback here is that your weather and traffic would not be displayed on the panel, but rather on an iPad or other portable device. But this allows you to upgrade your portable ADS-B In more often and less expensively that would be possible with a certified ADS-B In solution. When to purchase an ADS-B Out solution is pretty simple these days: soon. Certainly if your transponder quits, it's sensible to replace it with a full ADS-B Out unit instead of spending the money on a soon-to-be-outdated Mode C transponder. If you want a reliable traffic picture, an ADS-B Out transponder is also a good investment. While you certainly shouldn't feel like you have to upgrade to ADS-B Out today, it's time to make a plan - avionics shops are getting very busy, and you don't want to be grounded on January 1.